What’s the deal with Raw Milk? Should we be drinking it? Australia is pretty conservative when it comes to food and food safety. An example of this can be found in our food laws, which currently prohibit two products that, in my opinion, should be available for all to consume – hemp seeds and raw milk. Hemp seeds and unpasteurised dairy products (including raw milk) are not legally available in this country. The debate around raw milk in particular is really heating up…so I thought we’d find out what all the fuss is about. Raw milk is essentially milk in it’s most natural state, straight from the udder, that has not been pasteurised or homogenised. Being a natural product, milk has the potential to be exposed to contamination by bacterial pathogens. Pasteurisation is the process that milk in Australia must undergo to be fit for legal sale, and it involves the heating of the milk to kill off any potential pathogens, theoretically making it safe for consumers to drink. Dairy Australia state on their website that “pasteurisation by heat treatment is essential to ensure that milk is safe to consume.” Pathogens can come from the mammary glands of the cow, the lymph nodes, unhygienic equipment or human handling. 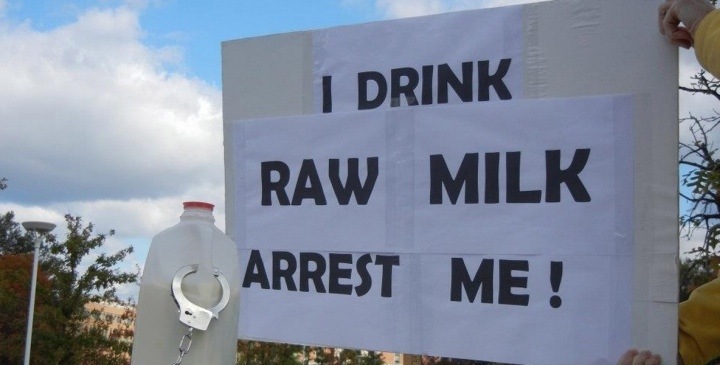 So why would we want to consume raw milk then? Well, there is a massive global movement toward raw milk, and the argument is that this natural product is not only highly nutritious, but actually offers enormous benefits in terms of immunity to both adults and children. This alone sounds pretty good to me, but what I found really interesting is that whilst doing my research on this topic, I came across dozens of people who credit raw milk with helping heal their intolerance to milk. Say what? Milk actually helped heal them of an intolerance to milk? Confusing….but true! It seems that raw milk with its active enzymes, microbial profile, good fats, high levels of protein and conjugated linoleic acid, is a nutrition powerhouse, and has actually proven in many cases to contribute to gut and digestive health. I’m putting my hand up to say YES to raw milk! The thing is, if raw milk is available to buy and consume, it doesn’t mean we all have to drink it. But at least we’ll have the choice. I watched a super interesting doco called ‘Farmageddon’ recently, which centres around the raw milk debate in the US. One lady in this film rightly highlights the contradiction we currently have in our food system, and that is, we don’t have the choice to feed our children a food such as raw milk with its endless nutritional benefits, yet if we choose to, we can legally feed them fast food and all sorts of other junk at every meal. You can even legally smoke and drink the whole way through pregnancy if you choose. We need to be more logical in our approach to food…..I mean, it’s raw milk for pete’s sake! Weirdly enough, you can actually purchase raw milk as a ‘natural bathing product’ in Australia. Go figure. I’d love to hear any of your thoughts on this topic! This entry was tagged Australia, debate, foodlaws, hempseeds, milk, nutrition, rawmilk. Bookmark the permalink.